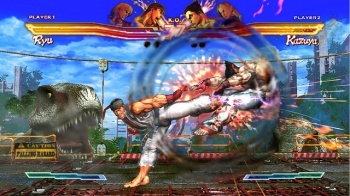 If you're playing Street Fighter X Tekken on an Xbox 360, you're not getting the full experience, and Capcom is very sorry about that. ... we've been asked by some players of the Xbox 360 version about the 4-player co-op mode and why it doesn't work when two players team up (locally) and attempt to play online. Unfortunately, due to time and resource issues, we weren't able to get that feature into the Xbox 360 version and we apologize to those players who were looking forward to it. Throughout the development process, there are times when new features are added (and we added a lot of them!) and there are also times where we have to make tough decisions regarding things to cut. This was one of those times. This mode is supported in the PlayStation 3 version, however, since we tackled that earlier and found the architecture of their system to be more conducive to implementing it. This is the most content we've ever packed into a Street Fighter game, so we hope that there are plenty of other modes and features to keep everyone busy for a long time. Alongside the surprisingly transparent admission, Ayano also claims to "have some information regarding new updates for Street Fighter X Tekken coming up soon," though offers no hint as to what they might be. Guesses? The upcoming DLC characters have already been announced, so I'm hoping for something a bit more esoteric. Something with bowling balls and pins shaped like Heihachi.